Earlier this fall, I attended Best Buy Canada's Smart Home preview event in Leslieville where their super smart technicians had decked out a spectacular home with the coolest (dare I say sexiest?) smart tech I have seen in a long time. From smart cameras and smart lighting to smart locks and smart alarms, the place was outfitted from top to bottom with the latest and greatest home security gadgets. On the top of my list of must-have smart home products? Philips Hue Personal Wireless Lighting. You aren't mistaken. You did just read, "wireless lighting." Using Smart LED light bulbs along with a hue bridge and your smart phone, you can have customizable mood lighting at your finger tips. You can adjust bulb tone and contrast, choosing from up to 16 million different colours and various tones of white. You can also use a timer that lets you set your lights to turn on and off when you're not home or have them gradually illuminate by a few degrees at a time to gently bring you out of sleep. Philips Hue lights aren't cheap, though, but they estimate these bulbs will last over 15,000 hours. The Philips Hue starter kit seen above will usually run you $200 but it is on sale for $50 off at Best Buy until December 24. In addition to Hue light bulbs, Philips also makes Bloom Luminaire lights, Hue Go Portable Lights which you can take with you from room to room, LightStrips for unique lighting options and Hue Iris Add-On Smart LED Lights that are dimmable and are able to sync with your music. And if that isn't smart enough for you, Philips Hue also works with Nest. When you purchase a Nest Thermostat, Nest Protect or Nest Cam, they recognize other 'Works with Nest' products in your home and learn from one another. 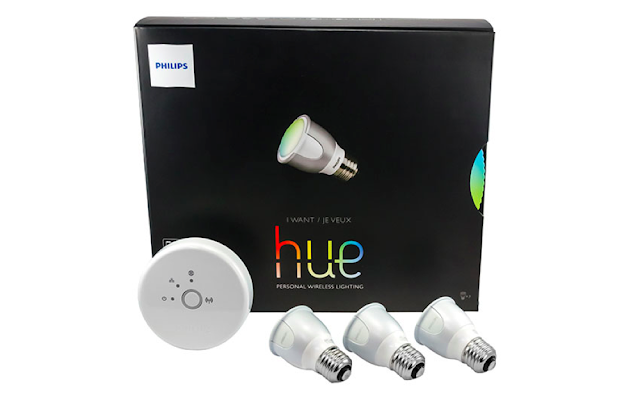 For example, you can connect the Philips Hue app to Nest and when Nest Cam senses motion in your home while you're away, Philips Hue lights can turn on and off as if you were home. 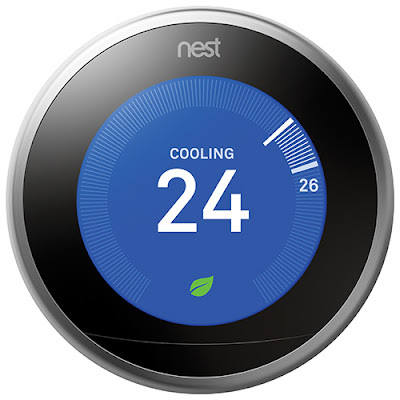 Nest's newest product is their 3rd generation Learning Thermostat. It remembers what temperatures you like, learns your schedule, and programs itself to save energy. The LCD display is ultra sharp and lights up when you approach. It is WiFi connected so you can control it with your mobile device, too. Then there's the Nest Protect WiFi Smoke & Carbon Monoxide Alarm which can distinguish between levels of urgency in smoke and CO levels, and instantly send you alerts on your smartphone upon detection. And because it is part of the Nest smart home ecosystem, it can work with your Rachio Smart Sprinkler to turn on the outdoor sprinkler system when a fire is detected. How smart is that! For more on the latest Smart Home products, visit the Best Buy Canada web site. And don't forget to check out some of the exclusive PayPal only deals at BestBuy.ca for more smart home product savings from December 12 to 14, 2015. The Nest system sounds fantastic! I think the world is almost at The Jetson's level, but we must work on the flying cars lol Thanks for the info, it was really helpful! This Nest system is so fascinating - I have been hearing more and more about it, and it sounds so cool. Wow! Times sure have changed in my life time, this sounds great! The Nest System sounds so neat. My hubby would love one in our home. Nest Protect WiFi Smoke & Carbon Monoxide Alarm looks pretty cool, tech goes forward every year! Does sound great but I'm so clueless with these wireless things. How neat are they, great that you can turn your lights on or adjust your homes temperature when you are out! technology sure is amazing, who would have thought wireless lighting? !